While most of my experience with photography has been spent around busy people and bustling places, getting out into a more natural setting requires a fresh review of the skills I thought I had as a photographer. It also allows a chance to weather down the distinctly different sense of busyness that comes when engrossed in an full, flourishing, and unfamiliar environment. After finding some free time one afternoon, I decided to wander down some trails that I had previously visited briefly in the weeks before. Coming from an urban environment, it really is a shock to the system to be somewhere with so little noise. This is a close-up of the Douglas fir that is seen to the left of the previous photo. Partially because there was nobody else around, and because the sun began to set in a fantastic way that shone through the flora, I spent around twenty minutes in a stretch of the trail not more than five meters long. During a trip to Fort Yamhill State Heritage Area, the small group I was with repeatedly heard a bird call that we could not place. Instead of putting on my city lens and walking away without paying the event any mind, I decided to stop and look for the culprit. The wait between each call was a struggle with impatience, but after a couple of long minutes, we spotted this (most likely) osprey hanging out and yelling at us from about 50 meters away. One of the first things that was pointed out to our group on a trip to Mt. Hebo was the existence of wild strawberries that grew practically everywhere around the visiting areas. The size of the berries surprised me at first, while I was not expecting full grocery store sized strawberries, the wild ones were no larger than a dime. Getting a decent photo of them took becoming uncomfortably familiar with the low lying plants in the area as I had to nearly lie down on top of them. Wild berries have since lent themselves a much more central role in the free time we find ourselves, resulting in our crew planning our weekends around the optimal times to go collect more. Queen Anne’s lace or poison hemlock? A question that was asked far too many times for anyone’s comfort on our trip to Cape Meares. I found myself noting the more subtle differences between the similar looking plants as we wandered. In an effort to take pictures of the flower with the prettier name that is markedly less poisonous, I ended up with over a dozen pictures of very similar looking flowers. In the end, this one was my favorite… and it is definitely poison hemlock. At the end of the fourth week of the program, it still feels like there is so much to learn and do out here in the Confederated Tribes of Grand Ronde. We are kept busy every day with new projects and fresh dirt, all of which offer new photographic opportunities on site. Photography offers a window to focus on a subject that can be as broad or specific as one’s own technology allows. In my case, preferring a longer lens forces me to consider more definite and distinct focal points, helping me slow down and take in the environment piece by piece. Each of those pieces has a story to tell, and I’m hoping to capture a single perspective of the massive narrative around me. All photos are my own, taken with a Nikon D7100, and are unedited. One of the most striking things I have noticed at Grand Ronde was the use of Chinook Wawa language during a gathering at the Achaf-Hammi Plank House, several days after arriving at Grand Ronde. While I had expected to be introduced to new topics and subjects, language use and its importance to the local community had not really crossed my mind. Over the following days, I learned about the Confederate of Tribes of Grand Ronde, who include Kalapuya, Molalla, Rogue River Athabaskans,Shasta, and Umpqua peoples and I also learned more about Chinook Wawa, the language that is spoken by Grand Ronde tribal members today. The history of the language is interesting in itself, and it illustrates some of the population’s history, in that it was first used as a trade language between the tribes along the Columbia long before they were forced to move to the reservation in the 1850’s. In order to communicate the tribes began using an old trade language, a jargon comprised of several dialects. Language, as expected, is intricately linked to culture and traditions of a community, and Chinook Wawa is no different. In the face of the trauma caused by forcible removal, extreme violence, and oppression from their colonizers, the different tribes realized that they needed to band together to survive. A common language was one of the ways in which the tribes came together to form a new normal out of the upheaval (Native-Language, 2015). As time passed from the tribes to the reservation in 1856 to the current day, the language also experienced changes, and losses. Outside pressure to assimilate to mainstream ‘American’ society made it clear in various ways that assimilation was not only desired, but expected. For some, leaving behind their language, culture and traditions seemed to offer the chance for a brighter future. For the community at large, it was a blow that would take a long time to recover from (Lewis, 2013). The next challenge to Chinook Wawa and the Confederate Grand Ronde Tribes was with the termination of the tribes in the 1950’s. The termination was one more attempt at forced integration of tribal people, which greatly weakened the community as some members left completely. It is no surprise that the language also suffered. On speaking to a local tribe member, I learned that there aren’t many adults fluent in Chinook Wawa. Efforts to reintroduce and revitalized the language have proven to be successful, especially with the language program that children of preschool and kindergarten age are enrolled in. This age group has shown a grasp of the language that they carry well past those first few years of schooling, a bright sign for the future of Chinook Wawa as a spoken language. 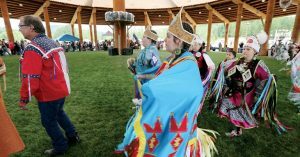 At present, Chinook Wawa’s presence is heard all over Grand Ronde, from the bilingual street signs on the government campus, to songs, and stories told at the Plank House during gatherings, as well as at the Powwow. Speakers of this unique language have come together in many ways, from making short films like Huyhuy, which went on to show at the ImagineNATIVE festival in Toronto, to a language app that aims to create new avenues for learning the language. My short exposure to the community at Grand Ronde and the cultural events made it clear that the language not only still alive, but an integral part of the traditions, culture, and life of the Grand Ronde Tribes. Lewis, David G. 2013. “A house built on Cedar Planks.” Willamette Valley Voices: Special Edition Confederate Tribes of Grande Ronde Articles. Natasha has always been interested in stories, and though she took the long way around, she finally found a field of study where the stories matter. Her background is in Biology and Anthropology with a focus on traditional indigenous architecture. She was excited to be able to participate in the FMIA field school as it intersected with all her areas of interest, and knows that what she learns during the program will be invaluable in the future. I would like to introduce myself. I am a senior at Oregon State University in Corvallis Oregon, obtaining my degree in Archaeology. I am also a member of the Confederated Tribes of Grand Ronde, a grandmother of 7, and am an avid learner. I have been interested in Archaeology for some time but hadn’t pursued a career in this direction. This is my 3 professional pursuit; I previously ventured in Nutrition and worked as an industrial, commercial electrician. My biggest goal, I feel, in my latest learning endeavor is to overcome my fear of the computer. Luke is a currently a student at the University of Washington in Seattle. There he is in his senior year studying archaeology sciences. His specific interests are in Indigenous North American archaeology and ancient Western Asian archaeology. His interests in archaeology started with the post-modern classic Atlantis: The Lost Empire. Upon realizing that most empires are well documented, he settled for the more realistic equivalent of contemporary archaeological sciences. Luke is passionate about photography and technology. Much of his free time is spent wandering the streets of Seattle in search for interesting subjects to photograph, as well as pestering friends in an effort to fulfill his urge to take as many portraits as possible. This is Barney, an undergraduate student in archeology at the University of Washington. I grew up watching the Discovery Channel, reading stuff about the great pyramids, Atlantis, and “UFOs”, something we now call pseudo-archeology (or not, who knows). These early experiences spurred my great interest in archeology and now here I am, studying archeology at the Field Methods in Indigenous Archaeology field school. Other than archeological readings and articles, I have plenty of other hobbies such as music and sports: I am a fan of the digital band Gorillaz, and I watch and play soccer, (used to be a goalkeeper at a UW soccer club but not anymore). Intermilan is my favorite team, even they haven’t been doing very well recently. I hope I can learn as much as I can in this field school and I will try my best to help wherever I can. Barney out. I heard this during the veteran’s pow-wow, an event that honors all veterans–tribal and non tribal–that fought for the United States of America in the past. Veterans entered in the front of the front of the dancers, as they fought in the front lane of the battlefield, and they will be giving a small introduction about themselves: who are they, where and when they fought for the country. Some took this chance to honor their parents or even grandparents who were also veterans. The Veterans pow wow also provided great opportunities to help veterans and their family members, such as offering health care or helping reconnect them to civilian life (Dean Rhodes, veterans’ weekend arrives with summit pow wow), which may not be mentioned during the main activities though. We respect the elders and we help and care about them, put them at the first place, not simply because they are old or we think they need us to help them, but for what they have done and suffered to make their lives, their society (which becomes our society), and their offsprings’ lives (which could be ours) better. This kind of respect is not unique to Grand Ronde; we can see it in every corner of our world! Think about the constructors who made us the foundations and houses for us to stay safe; think about the hunters and the food gatherers who bring us food when we were waiting for them; think about the warriors, the veterans (like what we did at pow wow!) think about all of them and what they have done to contribute the world the society we live in now. They did what they could when they were young and strong(some of them still stood in their place even when they were not young anymore), and when their age added up, when they were not able to wave the tool, shouldn’t we be grateful for what they have done and make sure they had what they deserve? This kind of respect and consideration for veterans and the elders is not only to make sure that they can enjoy what they deserve after what they have done for our generation, it is also for our generation to remember and to honor their actions. Through the actions of the elder, our generation has the responsibility to see what our ancestors and elders have done for us, learn their wisdom by listening to their words, and most importantly feel them with our heart. The elders, are just like a beautiful song, like the song for the ancestors that was sung in the plank house. “Think about our ancestor, who had suffered so much during the time that they were forced to travel to this place, think about their sacrifices, their contribution, now we are sitting in the plank house, let us remember our ancestors, as we should remember our tradition” Bobby Mercier spoke these words. May the elders (and ancestors!) guide us with their wisdom, and long live the elders! I have not always been an archaeologist. I started my academic career in audio, video, and animation. After a few years of freelance videography, I realized one, that filming weddings every weekend is absolutely soul-sucking, and two, that I needed to be challenged again. I took a few scuba diving classes and (re)discovered a love for underwater/maritime archaeology. In undergrad I finished multiple research projects which led me away from underwater archaeology and more toward my strengths of digital media production. I finished a B.S. in archaeological studies at the University of Wisconsin-La Crosse in 2014. I made the decision to apply for graduate school and boom! I just finished my second year as an archaeology graduate student at the University of Washington. My research interests are museum curation, landscape archaeology, geophysical survey, Indigenous archaeology, GIS, and Northwest Coast Archaeology.